Is available in a range of products including toothpaste, sprays and brushes. Please note: The manufacturer description of this mouthwash suggests it can restore natural whiteness, but this mouthwash will not change the natural colour of your teeth. 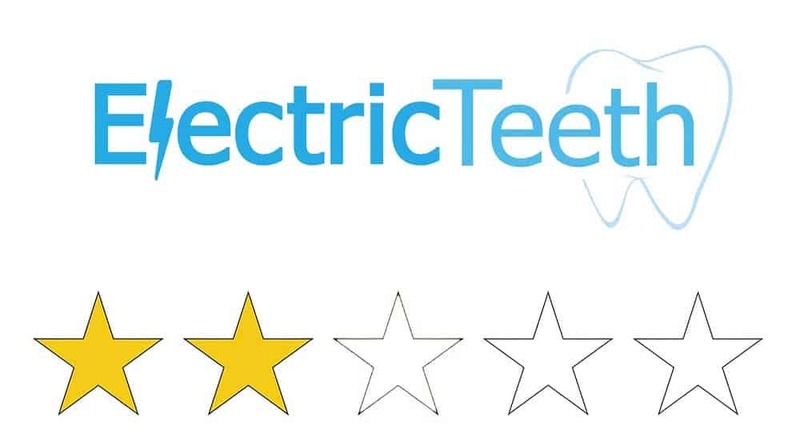 At best it can remove external staining on the tooth surface, lifting discolouration and revealing the natural tooth colour, that may have been hidden, therefore gaining a whitening effect. It cannot change the natural tooth colour, you require professional tooth bleaching/whitening for this to happen. Have you been looking for a mouthwash which will help eliminate bad breath and help protect those teeth and gums? Are you considering purchasing Ultradex Daily Oral Rinse mouthwash? If the answer is yes, what follows is a detailed review which some give you some ideas as to whether this is the mouthwash for you. Clinically proven to instantly eliminate bad breath compounds (Volatile Sulphur Compounds) for 12 hour fresh breath confidence. Protects teeth & gums by inhibiting harmful bacteria. Restores natural teeth whiteness by gently lifting everyday stains. Free from alcohol, chlorhexidine and colouring. Unflavoured, supplied with optional mint flavour sachet. Partially. It worked to help my teeth feel clean but didn’t offer the freshness I would expect. At the time of writing the cost ranges from £6.40 through to £8.50 and is available from quite a few retailers, including most supermarkets and online retailers. For the quoted price you get a 500ml bottle of the Ultradex rinse. Of course, the price you pay may vary given the time and location of purchase. However, do not pay over £8.15 as this would be higher than the recommended retail price. Sainsbury’s, Asda, Tesco, Waitrose, Boots, Ocado and Superdrug in the UK are locations from which you can purchase the Ultradex mouthwash. Many of these sellers have online shops too (view Ultrdex on Amazon). It just depends on whether you want to order it online or collect it in person. This would not be my first recommendation for a mouthwash, but I have no reasons to say do not use it. I don’t think this mouthwash offers as much as others on the market do, and the others can often be purchased for a cheaper price. It doesn’t work as well as I would expect it to, and have found that different mouthwashes could offer me better freshness. It also doesn’t taste as nice as others I have tried. A mouthwash, when used correctly, can aid in keeping the mouth healthy and looking great by reducing bacteria, and strengthening the enamel. Where a mouthwash or rinse like the Ultradex daily oral rinse comes into best effect is when you do not have a toothbrush. Brushing your teeth more than twice a day can potentially have more damaging effects than positive ones. So after lunch or a meal, a mouthwash is one way to safely cleanse the mouth and wash away unwanted food debris and bacteria that may be building up in the mouth and perfect that smile. On test here, the 500ml bottle of Ultradex rinse is said to restore natural whiteness to your teeth, help eliminate bad breath and protect teeth and gums. This is an everyday mouthwash that can be used safely a couple of times a day for as long as you like. The guidance on the Ultradex box is to use twice daily before or after brushing. You could use it more or less, there is to my knowledge any harm that can be done by this, but there are limited arguments to exceed use more than twice a day. Professional guidance, including that from the NHS is to use mouthwash after brushing the teeth, but not immediately after. I prefer to use after eating or when I feel I wish to freshen my mouth up a little. This test lasted for 1 week. 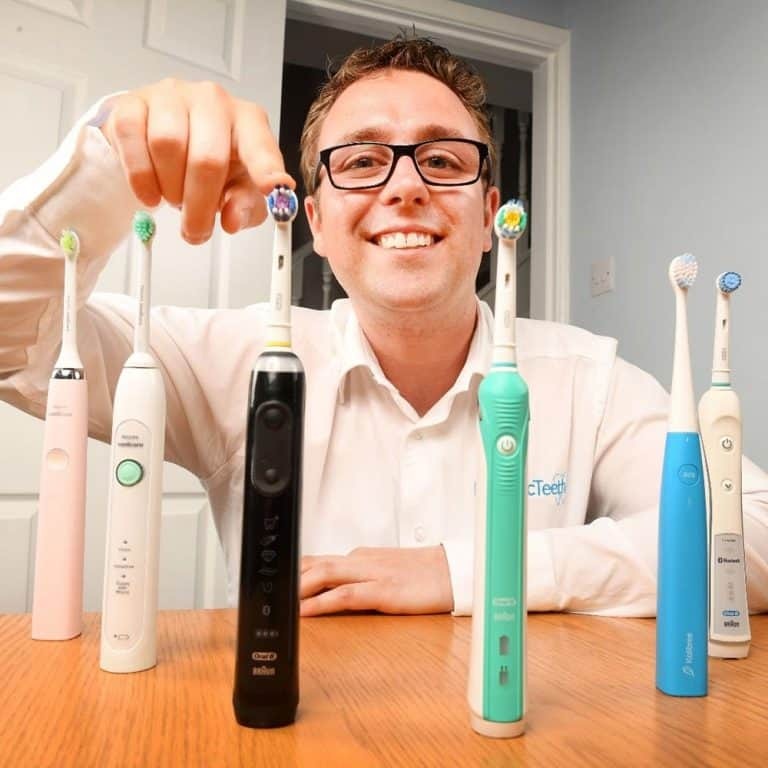 In line with this, my normal tooth brushing pattern remained, cleaning my teeth twice a day for 2 minutes with an Oral-B electric toothbrush, the Advanced Power with Oral-B 3D White toothpaste. Morning or night this mouthwash is there for you. The mouthwash itself is clear in colour. It has quite a strong smell to it if you put your nose in close to the bottle. This smell is not as pleasant as expected and smells a bit stale instead of completely minty. The mouthwash comes with a flavour sachet which you can add if you want to. I tried the mouthwash before putting in the sachet to see what it tasted like and I was surprised to find the taste was very bitter and stale. It is definitely one of the worst I have experienced. After putting in the flavour sachet and giving it a good mix as the box suggested, I tasted it again and found that unfortunately, the taste was not much different to before. The minty flavour from the sachet was not strong enough to cover the original bitterness. During the time the mouthwash spent in my mouth, there was a very slight kick to it but not as much so as others I have tasted. Unlike others, there was no tingling sensation that would make it feel like it was really working, however, this does not mean the mouthwash didn’t do what it was intended to. Once spat out, there wasn’t a noticeably strong freshness really, but there was an aftertaste which didn’t taste very pleasant. My mouth did feel cleaner after use just not very much fresher. Whilst the taste may not have been to my liking, it is a short term dislike for the hygiene benefits it brings. The ingredients in the mouthwash are Aqua, Chlorine Dioxide, Trisodium Phosphate, Sodium Monofluorophosphate, (230 ppm Fluoride), Citric Acid, Sodium Chlorite and Sodium Bicarbonate. The ingredients in the flavour sachet are Polysorbate 20, PEG-60, Hydrogenated Castor Oil, Aroma, Menthol, Saccharin, Limonene and Linalool. For those interested, there is no alcohol in this mouthwash and it contains 230ppm fluoride. The lack of alcohol could explain why this mouthwash doesn’t have as much as a kick as others. Any real positive benefit requires science, tools and tests well beyond the scope of what I have available. Do remember mouthwash is not a critical part of an oral regime, you could go without but there are benefits when used at times when using a toothbrush is not practical, convenient or required. The recommended dosage is 15ml. Swish this around the mouth for about 30 seconds and then spit out. Do not rinse mouth with water after use. From the 500ml bottle will get approximately 33 uses out of it. If you then use twice a day you are getting about 16-17 days use from the bottle. If you ever receive advice from your dentist or hygienist to alter your routine do take notice of what they say. As with any product used within the mouth, should you notice any side effects stop using and seek further assistance. It is not advised for children of age 6 and under to use this mouthwash. 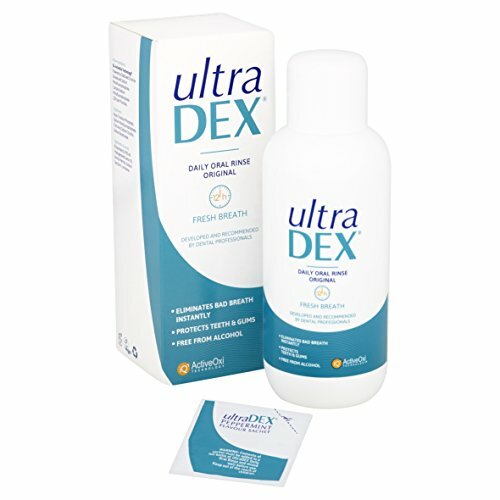 Prices for UltraDEX range typically from £6.40 to £8.50. At the higher end of the scale, this works out at £0.26p per rinse and £0.19p if you can source for £6.40 or less. For comparison’s sake, a conventional everyday mouthwash can work out at about 4-5p per use. This is quite a lot less than the £0.19p you are paying for the UltraDEX (view on Amazon). This is not me saying do not use this product, this is just my personal opinion. Those who focus on getting their teeth white are often concerned about their image and how others perceive them. Be this vanity or a lack of confidence to smile the addition of a whitening mouthwash is unlikely to have any significant impact. The mouthwash may help with staining experienced most commonly by smokers, avid coffee and red wine drinkers, but a good toothpaste and brushing routine will likely be more effective. The bottle is not glamorous, it is a matte white colour with a glossy white lid. It is a conventional shape and perfectly designed to store mouthwash in. The cap and bottle are completely smooth meaning that if the bottle gets wet it could be slippery or hard to grip. The bottle isn’t as bulky as other 500ml bottles I have tested before. The bold blue coloured labels front and back catch the eye and clearly explain and show what it is. There seems to not be that much in the way of safety instructions, however, this could be because there is no alcohol contained in this mouthwash. There is no leaflet included in the box either. Once removed, the cap has a very skinny bit inside which connected to the neck of the bottle when screwed on to keep it sealed. This skinny neck means that the cap isn’t really suitable to be used to measure the mouthwash in, meaning you will need to find an alternate method of measurement. This could be a teaspoon for example as on the box it states that the 15ml dose is the equivalent of 3 teaspoonfuls. The only positive to the bottle having a skinny neck means it will be easier to pour the mouthwash. All told it looks smart and but is a little difficult to use. Unlike Corsodyl or Colgate Peroxyl which has been specifically designed to target a particular condition or irritation in the mouth, the Ultradex mouthwash looks to offer protection for teeth and gums, prevent bacteria build up to eliminate bad breath and restore the natural colour of the teeth. It’s hard to tell if this mouthwash is really as effective as it is made out to be, but I think over time, this could actually do what it says. Testing it for only a week makes it hard to tell as it is a very short time to see any changes, however after the first few uses my teeth did feel cleaner. The only thing I would argue about with this mouthwash is if it really eliminates bad breath for 12 hours. I tested this mouthwash after eating in the evenings and it found it quite ineffective at making my breath feel fresh or getting rid of the taste of the food I had eaten before. Conclusion, is Ultradex Daily Oral Rinse mouthwash any good? Aside from cost and a personal lack of appeal for the initial taste I see no reason not to use Ultradex mouthwash. There is no evidence to suggest it is better or worse than cheaper alternatives but I would definitely consider other options before going for this one. Where can I buy Ultradex mouthwash? You may find some Boots or Superdrug stores stocking this on the high street along with Sainsbury’s, Asda and Tesco supermarkets and online supermarket Ocado. It may be a little easier to purchase online. Ultradex offers an approved list of sellers online. What are the ingredients in Ultradex? The mouthwash contains Aqua, Chlorine Dioxide, Trisodium Phosphate, Sodium Monofluorophosphate, (230 ppm Fluoride), Citric Acid, Sodium Chlorite and Sodium Bicarbonate. The flavour sachet contains Polysorbate 20, PEG-60, Hydrogenated Castor Oil, Aroma, Menthol, Saccharin, Limonene and Linalool. The taste is very bland and bitter, and is only a little bit minty when the flavour sachet is added. It is advised to rinse twice a day. For best effects use some time after having cleaned your teeth to avoid undoing the work of the toothpaste. I found no actual pain, there is a slight kick but it is hardly noticeable. A 500ml bottle will last 33 uses of 15ml dosages or up to 16-17 days. Although one of the main purposes of this mouthwash is to eliminate bad breath, I did not find it worked that well. From what age can Ultradex be used? The labelling suggests any child over the age of 6 can use this mouthwash. The advised directions for use are to rinse in the mouth for 30 seconds, spit out and do not swallow. Does 3D White Luxe stain the teeth?